It takes a manly man to agree to wear a pink cast. My husband finally had his splint removed today. I never thought to take a picture of it, but it looked a lot like a cast with an Ace bandage around it. I’m not sure why they use that instead of a cast after surgery (perhaps to give room for expansion from the inevitable post-surgery swelling). But after just about three weeks of the splint, my husband had that removed today to be replaced with a proper cast for the next two weeks. The incision is healing well, but I personally think that whoever did the stitches didn’t do a very good job. I’m afraid it’s going to leave a very lumpy, inflexible, and painful scar. The stitches themselves were very painful for my über-tough husband to have pulled out. The tech said that they had been put in too tight and with too many knots. He actually seemed angry about it as he removed them, as if he couldn’t believe someone could do that bad of a job. Hmm, that can’t be a good sign. Oh, well. I guess we’ll have to wait and see. 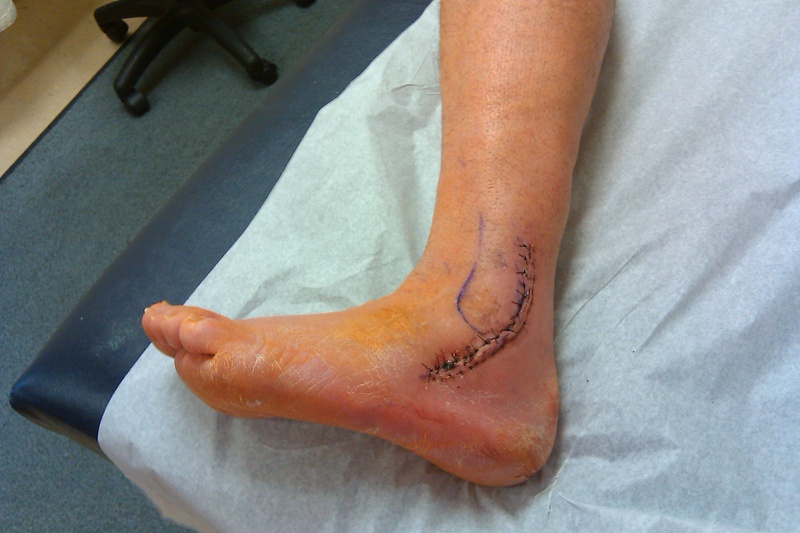 Maybe the incision will flatten out and look better when my husband gets the cast off. Ewww! Only click if you want to see the very graphic closeup. On the way to the doctor’s office, I mentioned to my husband that I had seen a man the day before riding an electric cart at the grocery store wearing a splint just like my husband’s, but his had been wrapped with pink. I had thought to myself how manly and secure that made him look. If I’d had more time, I would have gone over to ask him about it. I bet there was some kind of sweet story behind it. 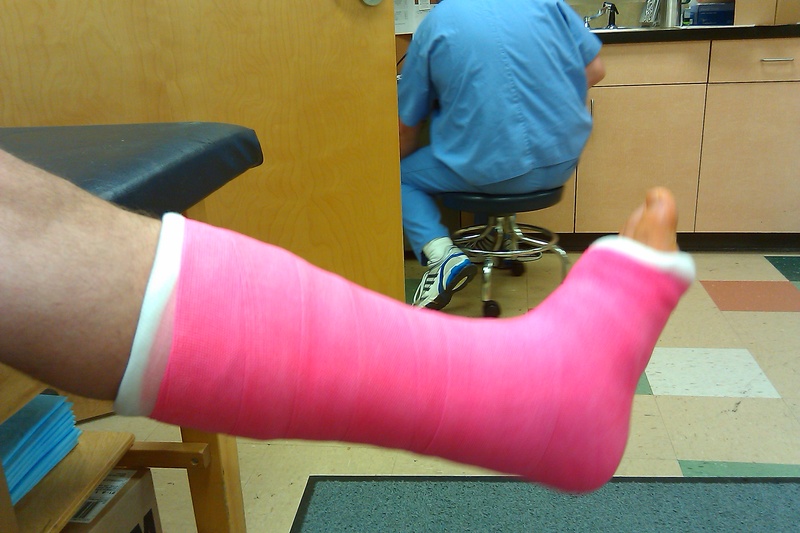 When the doctor asked my husband today what color of cast he wanted, he said, “Well, my wife wants me to get pink, so I guess I’ll get pink.” I was so surprised that he’d do that! The doctor said, “That’s a good choice! It shows that you are secure in your masculinity! Did you know that the entire men’s rugby team gets pink casts?” I wonder why. Maybe for a breast cancer awareness thing. Or maybe they all have wives, girlfriends, and/or daughters who like pink. When it came time to actually put on the cast, the tech sounded a little more uncertain. “Are you sure?” I told my husband I’d be fine with him getting blue (he looks breathtaking in royal blue), but he waved away the suggestion and said to bring on the pink. And I’ve gotta say, doesn’t it look beautiful? I’m so touched that my husband would get a pink cast for me. And I’m so impressed that he’s that secure! We went to Costco immediately afterwards, where the cast drew a lot of looks. It certainly doesn’t blend in! I told my husband, “If people see a man wearing a white or manly colored cast, they know there must be a tragic story behind it, and they won’t want to come near him. But if they see a man wearing a pink cast, they assume he must be okay or he wouldn’t be so lighthearted about it. It makes you very approachable.” Indeed, a baby girl at the store couldn’t quit staring and smiling, and while we were in line, a man actually came up to comment about it (“You’re obviously secure about your manhood!”), and after a brief discussion with my husband, he walked away smiling. Pink casts don’t look like medical devices. They look happy. But the cast also has an additional, unexpected effect. I, um, kind of feel like I’ve marked my territory. When a man is wearing a pink cast, it will almost always be because of his wife or girlfriend. A single, unattached (straight) man would never get a pink cast. So it’s almost like a giant wedding ring. There is absolutely no doubt to the world at large that this man is taken, and his significant other means enough to him that he agreed to a pink cast. Any man who would do less is less than a man. This entry was posted in Health, Marriage, Values. Bookmark the permalink.